Hosting some of the worlds most renowned electronic music artists, Vietnam’s Epizode Festival has exploded onto the international stage in the last couple of years. Taking place from 28th December 2018 and ending on 8th January 2019, Epizode provides a tropical alternative for Europe’s Winter New Years period, as well as an easy South-east Asia holiday for us Sydney-siders! 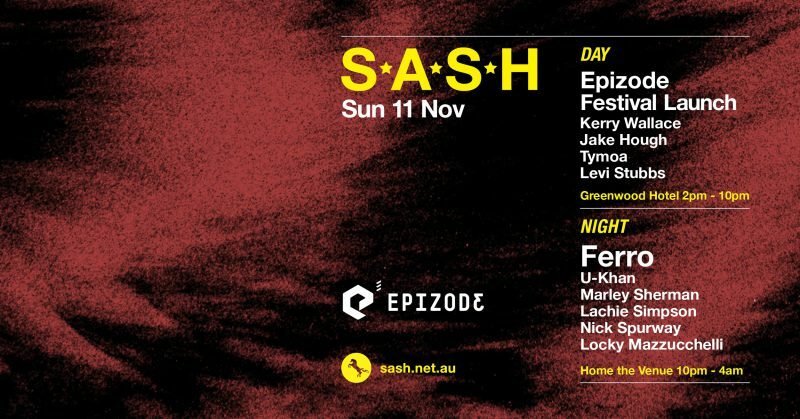 Our residents Kerry Wallace & Jake Hough are headed to ‘nam for New Years to play at Epizode3 so it only felt right to host a launch party at S.A.S.H By Day in anticipation for the festival. Joining Kerry & Jake and flying the Epizode flag is their resident Tyoma, easing us into the afternoon. First time on the horse and opening the party; Levi caught our attention at an afterhours, where he meticulously mixed La Musique into La Musique for 2 hours straight.. This relatively new festival has caught the attention of the underground dance community over the last couple of years with its high calibre lineup and outstanding setting on the Western part of Vietnam’s tropical paradise – Phu Quoc Island. Heading into its third year, the team behind the event have strived to create a completely new format for the region, focusing on modern art, music and culture. In anticipation for Jake & Kerry’s set at the Festival, we launch at S.A.S.H By Day with their resident Tyoma joining us, as well as young lad Levi Stubbs who just so happens to be heading to the festival to ring in the new year. In The Den we welcome back HOME a few old friends; Locky Mazzuchelli opens the blue room whilst Nick Spurway closes it, and taking the middle slot is Charades big boss & now Melbourne man U-Khan. The Terrace is a more stripped-back affair with Lokomotiv resident Lachie Simpson opening the room, and Marley Sherman to warm up for our special guest. Ferro comes all the way from The Netherlands after a busy European Summer season, and we are excited to have him back!